On 25 May 2017, demonstrations marking Freedom Day took place in cities across Belarus (Freedom Day is the anniversary of the announcement of the self-proclaimed Belarusian People’s Republic on 25 March 1918; it is celebrated mainly by Belarusian nationalists). The government’s reaction to the demonstrations was quite brutal: in Minsk the unauthorized rally, attended by several thousand people, was dispersed by the police and about seven hundred participants were detained. Similar rallies were held in Gomel, Brest, Grodno and Vitebsk. Belarusian anarchists have reported further searches and detentions. 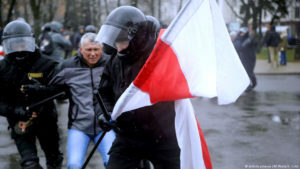 The events in Belarus are especially interesting in connection with the general European trend towards the unification of rightwing and “anti-systemic” protests, a tendency noted recently by Perry Anderson. In light of the recent Belarusian protests against Decree No. 3 “On the Prevention of Social Dependence” (or the so-called ‘social parasite tax’ of $230 to be levied on those unemployed for six months), the violent dispersal of a traditionally nationalistic rally raises a number of questions. To what extent do the participants in these two protests intersect? And why did the Belarusian government react so brutally to the nationalists when in Russia, in contrast, the nationalists are merely “kept on a short leash” and even encouraged if necessary? Who came to the protests? Were they “ordinary Belarusians” appalled by the social situation in the country or “professional” activists of the nationalist opposition? Can there be a “fusion” of the nationalist and social agendas? And will the nationalists be able to use yesterday’s detentions as a trump card to take control of social protest? OpenLeft discussed these questions with Belarusian activists. LeftEast reprints them with the kind translation of Tonya Anisimovich. Undoubtedly, the biggest share of responsibility for inflamed tensions and the unfolding repression lies with the authorities, starting with the adoption of the provocative and antisocial Decree No. 3. However, some irresponsible opposition activists also contributed to it, with blatant statements and the desire to escalate for the sake of geopolitical calculations. What initially started as a social protest now is being increasingly politicized. “Freedom Day” seems to have been the final step towards the substitution of a social agenda for the national one. If one is not familiar with the context, it may seem that the two sides are moving towards the “Maidan” scenario in agreement with each other. It’s classic: after 25 March, the leaders of the opposition will forget about the Decree, because the authorities gave them a good reason to, and the movement will go along under completely different slogans and for completely different purposes. In any case, the people – the working class and the unemployed – will be the losers again. That is, the Belarusian people. Outside Minsk, opposition activists were forced to focus more on the social basis of the protests. In Minsk everything was extremely politicized, because the leaders of the opposition were there. After the recent events, perhaps, there will be a differentiation in the opposition and the format of further actions will be changed. There have been disagreements within the opposition before as well, but mainly on the basis of personal ambitions or the degree of radicalism. For example, “Tell the Truth” [a campaign organized by the Belarusian research and educational organization “Movement Forward” – OL] took a rather moderate position. Outside Minsk the rallies went relatively peacefully, even though there were some detentions in Gomel. The opposition carried nationalist symbols and general democratic slogans, but the people were primarily protesting against the Decree. In Gomel the left modified the resolution of the protest, and, even though not all of their demands were included, the resolution turned out to be relatively social rather than political. I think it’s time for leftist forces in Belarus to clearly and actively express their position on the tough neoliberal policy of the authorities aimed at monetizing everything (with the latest example being the notorious Decree). I would say that the nationalist protest on Freedom Day and the protests against Decree No. 3 are two different protests, although the rightwing opposition certainly tried to harness and direct the same social dissatisfaction. However, its interests lie in a completely different sphere than that of the general population. Yesterday’s rally was originally intended as a rally of nationalists and liberals, in terms of the date, the participants, and the agenda. It’s true, however, that the right hoped that in the wake of the general social discontent (caused not only by the Decree itself, but by a number of other problems and unpopular measures taken by the authorities), ordinary people would also come to support them. The authorities were afraid of a potential union of the working class and the national democrats; that’s why they reacted so violently and with mass detentions, particularly at the last rally. It’s hard to say whether ordinary people came to the rally, as a lot of people could not gather in one place. A bunch of protesters passed along the avenue here and there. They were pushed aside, cordoned off, detained. In Minsk, in contrast to the provinces, the main participants at rallies are generally activists and urban intelligentsia, students. Even on 15 March, at a fully authorized event with a social (not a national-liberation) agenda, it still felt like the “activists” were the majority. I think that on 25 March most non-politicized people preferred to stay at home; the agenda of the event, the repressions on the eve of the event, and stories about arrested “militants” did not encourage their participation. As for the mass detentions, it is difficult to understand the logic of the current government. Every time following a short period of “liberalization” and “thaw,” such a high-profile crackdown is typical. One can only guess the reasons: it may be that the authorities think that the opposition “started to take liberties” and decided to remind them who is in charge, or it may be something else. It even comes to conspiracy theories about the “hand of Moscow,” or the slightly less radical theory that Putin promised the authorities something in exchange for suppressing pro-Western nationalists. I don’t know if it will work. Will it remove at least some of the problems? Will it provide consolation for people who are already desperate? In any case, for me these are two parallel worlds, two protests. One is purely social and not too open to politicization. The second is the traditional opposition, aspiring to take control of the first. I don’t feel particularly optimistic about the participants of the social protest achieving their goals, but I am glad that the electoral base of this regime is no longer silent, or at least has reminded the government of its existence. This is in itself an achievement against the backdrop of twenty years of silent indifference among the population, when the news only covered the conflicts the regime had with its standard opponents. The bad thing is that there are simply no left forces in Belarus ready to work with these people. It is necessary to understand that the social tension in Belarus has been growing slowly for quite a long time, affecting wider and wider segments of the population. It is the contract employment system that puts the employee in the position of a slave and is aimed, among other things, at keeping people from forming informal unions, conducting grassroots protests and strikes. It is the low and declining wages, while the president reassured everyone that the average wage in Belarus would reach $500/month by 2017. Inflation has been on the rise since 2010. In recent years, utility prices have been constantly rising, again with the population being blamed for being “socially dependent” on the government and forced to compensate for state subsidies. Growth of unemployment. Reduction of jobs. Road tolls. Inadequate enforcement in the sphere of drug trafficking. The system of compulsory placement of students after graduation. This is all just what lies on the surface. Every single Belarusian could name a dozen more things that personally hurt him. For example, the requirement to show a passport and have your photo taken when buying a sim card. Decree No. 3 “On the Prevention of Social Dependence” was the last straw. The unemployed came out against the decree because they have nothing to pay and the tax rests on the shoulders of their relatives, people who received a notice “by mistake,” and working citizens who understand that the surrealism of the situation has reached its peak, that the next thing will be a tax on air, and it too will be “constitutionally justified. The protests in the provinces and in Minsk were accompanied by a series of unreasonable arrests, including at officially authorized rallies. So to the social component of the protest were added citizens acting against the police outrage. On 25 March, on Freedom Day, all these social groups, scattered in their own interests but united by the fact that they do not need the authorities, took to the streets. The OMON [Otryad Mobilny Osobogo Naznacheniya or Special Purpose Mobility Units, the military police] used special measures against them and even against peaceful passersby not taking part in the protest. The authorities have shown that they are ready to use water cannons and firearms against civilians. As a result, about three hundred people have been detained and brought to court in the past two months, plus between two hundred and six hundred people detained during the Freedom Day protests and the day after. It should be clarified that Freedom Day is a purely nationalistic holiday, appropriated by the official opposition with demands that are divorced from the interests of the majority of the population of Belarus. During the years of Lukashenko’s rule, the symbolic significance of Belarusian national symbols has been modified. Now the Pahonia [the coat of arms of the Grand Duchy of Lithuania, adopted by the Belarusian Democratic Republic in 1918], the white-red-white flags, and the Belarusian language itself are all symbols of protest against the existing regime in general. It is a sign that we are different, that we have nothing in common with this red-green [referring to the colors of the current official Belarusian flag] government. Traditionally, the electorate of the nationalist opposition has participated in the Freedom Day rally, but represent only a small fraction of those who are dissatisfied. The same goes for the other protests against the Decree No. 3. The opposition is trying to find contact with the protesters and impose its agenda on them, but it does not find support. As for the combination of nationalistic and social protests, and attitudes towards Russia which may pose a threat to the independence of Belarus, I must say that this is a complicated issue. Most of the Belarusian population has little interest in Russia as long as the relations with it does not have an impact on their income, while the opposition considers Russia an aggressor by default. There are also pro-Russian groups that believe that the Republic of Belarus should exist only as part of the Russian Federation (they are also not popular among the general population). If there is a change of power, we will still have to negotiate with the Russian Federation (if there is no attempt at annexation). Personally, I do not consider Russia an aggressor against Belarus now. A protracted economic war has been going on for many years, but all conflicts are settled. Yes, the national opposition creates a visual imagery (since most ordinary people are not capable of it), but their ideas are not dominant, just as their people do not constitute the backbone of the protests. Everything is mixed up at the rallies. I’m not ready to give any forecasts, but most likely the protest movement will decline. Still, the Chernobyl Way [an annual opposition rally in remembrance of the Chernobyl disaster] is in April, so we’ll see.